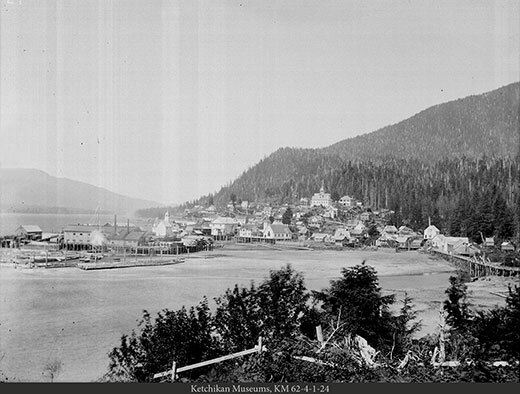 Buildings are in evidence: Ketchikan Power Company, Fire Hall and Hose Tower, Old Main School, Red Man Hall; Arthur Yates Hospital; Baseball Bleachers, St. Johns Church, Chief Johnson's House; The Salvation Army hall - Starr house; and buildings around the creek. 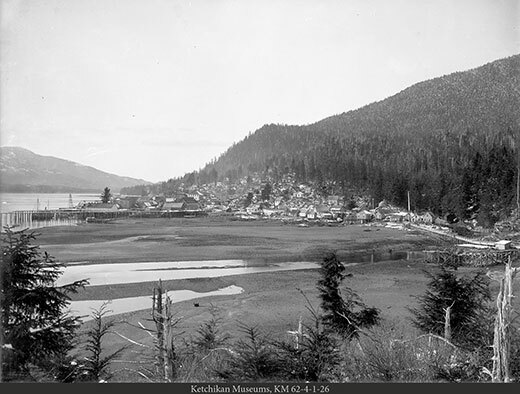 The building of the Ketchikan International Airport on Gravina Island, just across Tongass Narrows, was a major milestone for the community. But is also created a controversy that continues more than four decades after it was completed in 1973. The new airport was built on some of the only flat land in the area. 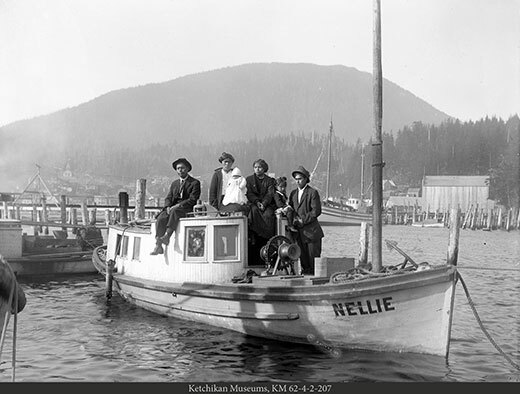 That section of Gravina had been the site of the small community of Port Gravina that had sprung up in the 1890s across Tongass Narrows from the equally small village of Ketchikan. Port Gravina had its own post office, a school, a shipyard and several other businesses, some of which were notable because they were the first Native-owned businesses in the Territory of Alaska. A massive fire destroyed most of Port Gravina in 1904 and it was never rebuilt. Over time, farms and other businesses took root on Gravina, but nothing was particularly successful because of its isolation from Ketchikan, particularly when winter storms could whip Tongass Narrows into a sometimes deadly frenzy. When the federal government originally proposed moving the region's airport from Annette Island to Ketchikan, Ketchikan residents suggest the flat land near Point Higgins 14 miles to the north of Downtown. The federal government, instead, chose the land on Gravina, just a quarter mile across the Tongass Narrows from Ketchikan's West End, about three miles from Downtown. At the time, the federal and state governments agreed to build a bridge across Tongass Narrows to provide access. Initially, while the bridge was being designed, two small passenger and car ferries would be purchased to provide access. But, decades passed, and the bridge was never built. Finally, more than 30 years after the airport was built, the federal government appropriated more than $200 million to build a bridge to Ketchikan's airport. But three things now complicated the project. In 1973, the bridge cost was $25 million. In 2003, it was between $200 million and $300 million. By the mid-2000s, mammoth cruise ships were now transiting the Tongass Narrows and the bridge would have to be nearly 200 feet above the water in places. And finally, the idea of "earmarks" in which Congressmen and Senators could target funding toward specific projects back home had become very controversial. 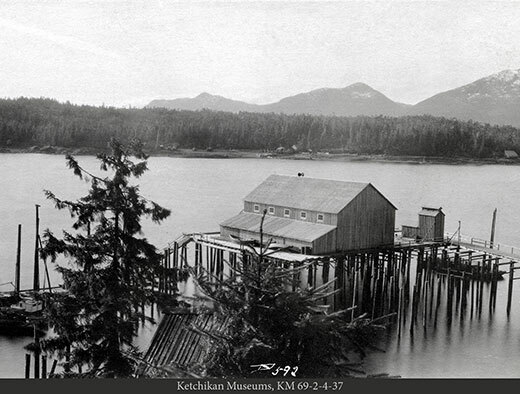 Ketchikan's proposed bridge became known nationally by its opponents as the "Bridge to Nowhere" because there were only 50 year-round residents on Gravina. That, of course, ignored the fact that more than 100,000 people used the airport every year. As a result, the additional money needed to complete the bridge was never appropriated and the project languished for another decade before the money was re-appropriated for other projects. Ketchikan's temporary airport ferries continue to ply Tongass Narrows after 43 years. Meanwhile, there are still proposals to develop land on Gravina Island. There have been some timber harvests on the island and several miles of roads have been connected to the airport ferry terminal. There is even a proposal to build an ore processing facility if a large-scale gold-silver-copper mine on Prince of Wales Island opens up in the next few years. There is also a three-mile road that goes from the airport to the point where the "Bridge to Nowhere" was expected to connect to Gravina.